The Plaza Waterfall Bath Taps with Shower Mixer are the perfect modern fixture for adding a designer touch to any new or existing bathroom. 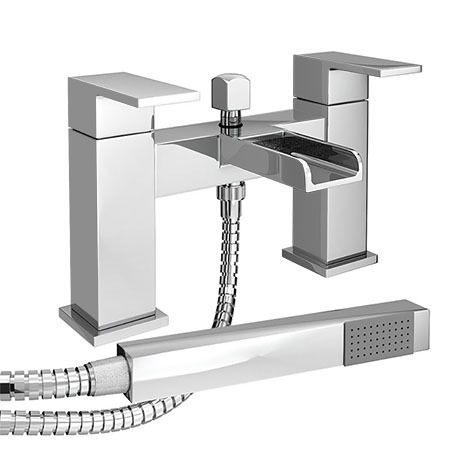 A designer, stylish look is created by these waterfall taps, with its open spout. The waterfall effect created by these taps will continue to excite and delight both you and guests. The Plaza Waterfall Bath Shower Mixer Taps come with a handheld shower head, wall bracket and flexible hose. Pair these Plaza Waterfall Taps with any other tap from the Plaza line for the complete designer look. 3 out of 3 found this question helpful. 4 out of 4 found this question helpful. "Well made, good value for money." "Looks very stylish, my plumber was impressed!" Cheapest I found online and it looks and works brilliantly. Nice product and very happy with the price. Great value and quality would recommend. Very Happy with products bought today. "I have to admit, at the price we paid i was a little skeptical about the quality of these taps, I didn't need to be, they are fantastic. Really weighty and look the part, can't wait to have our bathroom finished." Excellent good product and quality very pleased. Excellent quality and well packaged with quick delivery - great addition to new bathroom!